Thousands greeted the first reigning monarch to visit this country in Auckland’s aptly named Queen St. In scenes reminiscent of a modern-day rock concert, hundreds of people had camped overnight to secure a good spot for the occasion. The Queen visited 46 towns and cities and attended 110 separate functions during her stay. It was said that three in every four New Zealanders saw her. The country was gripped with patriotic fervour; sheep were even dyed red, white and blue. It was hard to spot a car that did not sport a Union Jack, or a building in the main cities that was not covered in bunting and flowers during the day or electric lights at night. 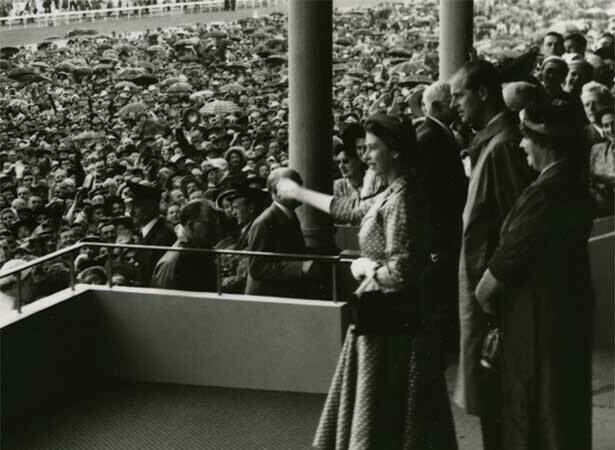 Sadly, the Queen’s triumphant arrival was swiftly followed by one of New Zealand’s darkest moments, when disaster struck at Tangiwai on the following night, Christmas Eve (see 24 December). We have 4 articles, related to Queen Elizabeth II arrives for royal tour.